The Bureau of Labor Statistics released this morning its regular weekly report on the number of American workers who had filed initial claims for unemployment insurance. Although there is a good deal of noise in this weekly data (so some analysts focus on the four-week moving average rather than on the weekly figures themselves), the report provides a useful early indication of developments in the labor market. It is now clear that the labor market situation is deteriorating. The graph above shows the figures (for both the weekly initial claims and for the four-week moving average) for the last year. 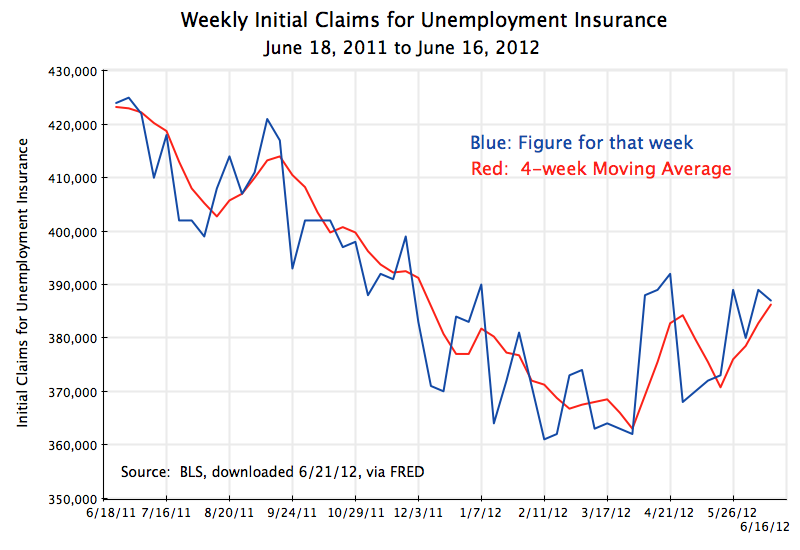 The trend was improving (weekly initial claims were falling) until mid to late March of this year. But it is now clear that there was a turn at that point, with the employment situation since then worsening. Using the four-week moving average, initial claims for unemployment insurance rose from 363,000 in late March, to 386,250 in the most recent figure. Keep in mind that with normal churn in the labor market, there will always be initial claims for unemployment insurance. Even with the economy at full employment, weekly initial claims will be at about 310,000 to 320,000 given the size of and extent of turnover in the US labor force (see the figure below for the numbers in 2006 and early 2007, before the downturn). And the rise in the weekly rate of initial claims for unemployment insurance could still be consistent with positive net job growth each month. The labor force is growing over time, although with significant month to month fluctuation in the number of people entering and leaving the labor force. Nevertheless, the turnaround and sustained increase in the weekly figure on initial claims for unemployment insurance is likely to be a signal that the unemployment rate may now start to rise for a period. This can be seen by looking at the initial claims figure in a longer term context, and correlating that with the overall unemployment rate. 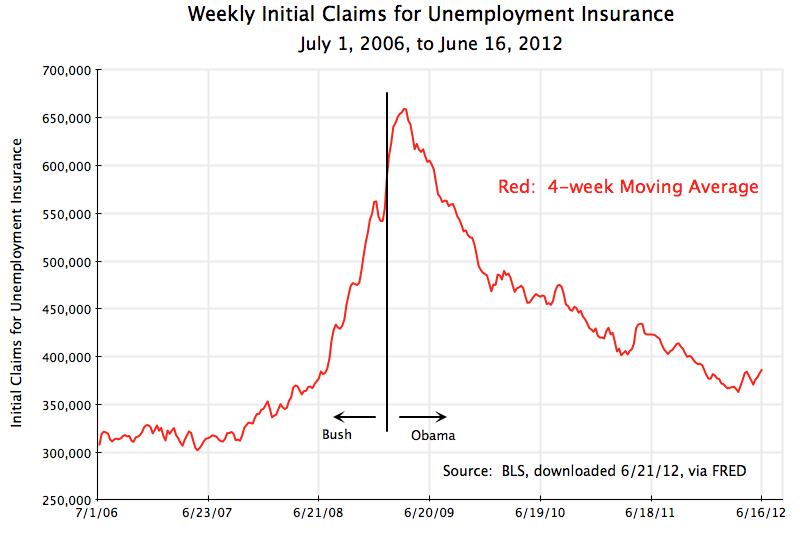 The first figure shows the weekly initial claims figure (four-week moving average) for the period from July 1, 2006, to now. 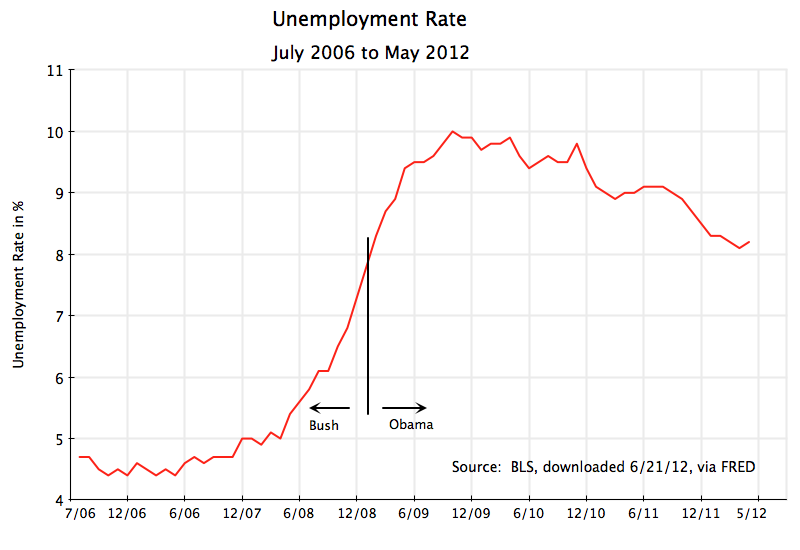 The second shows the unemployment rate. The sharp rise in the initial claims figure in the last year of the Bush Administration is clear, with a peak reached just after Obama took office. With new measures such as the Stimulus Bill (passed in February 2009) and other actions (such as continued aggressive measures by the US Federal Reserve Board), the economy started to turn around, and new claims for unemployment insurance began to diminish. But while the weekly pace was reduced, it was still high, and the overall rate of unemployment continued to rise for a period before starting to fall. The recovery has been weak, however. As noted previously in this blog (such as here, and here), fiscal drag from falling government expenditures (mainly at the state and local level, but also weakness at the federal level) can by itself account for this slow and weak recovery. And as seen in the figure above, in this weak recovery there have been two periods (between May and August 2010, and between March and June 2011) when initial claims reversed its downward path and began to rise for a period. In each of these times, the unemployment rate also then started to rise for about half a year (from June to November 2010, and from March to June/July/August 2011). The blip upwards of the unemployment rate last month to 8.2% from the earlier 8.1%, might therefore not be a fluke, but rather a signal of further weakness to come. Such a rise in the unemployment rate in the half year before an election should be particularly worrisome to any incumbent seeking re-election. And all this is unfortunately also consistent with the prediction made in this blog in January (see posting here), that despite what looked like an acceleration of growth in the second half of 2011, growth in 2012 could be weak. It appears that is what is happening. This entry was posted in Labor and tagged employment growth, unemployment by aneconomicsense. Bookmark the permalink.